JOIN US FOR A DELIGHTFUL EVENING AND ENJOY A 3 COURSE HOME COOKED DINNER AT OUR FABULOUS COOK SCHOOL ACCOMPANIED BY THE HOSPITALITY OF THE LARDER TEAM. 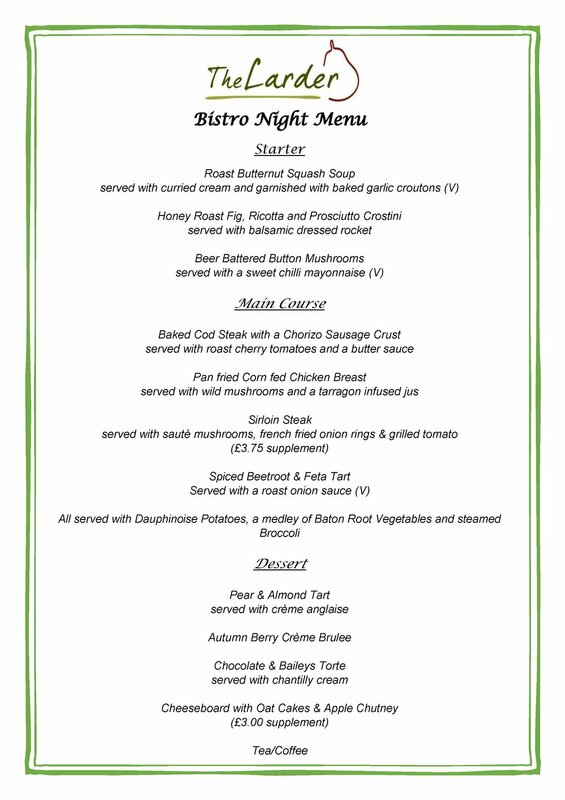 WE HAVE A DELICIOUS MENU PLANNED FOR YOU BEING CREATED BY YOUR CHEF FOR THE EVENING. PLEASE BYOB OF YOUR FAVOURITE TIPPLE JUST TO ADD EVEN MORE FUN TO THIS EVENING EVENT. You will love our unique open kitchen and dining room and enjoy the ambience of our Bistro. Tables can be booked from 6:30 til 10pm to suit your diary. We pride ourselves on the quality of the food we serve here at The Larder and cant wait to welcome you for a relaxing evening of good food, good company and good times. With a wide choice of dishes for each course and every one of them made from scratch here on the premises from fresh ingredients, the £25 price is sure to offer excellent value. To secure your table please book online. Supplements may apply to certain dishes specified on the menu.